8:00am Pick up by our tour guide and driver at Tianjin Cruise Port. Drive to Beijing city (about 3 hours), and visit Tiananmen Square and Forbidden City. Tiananmen Square which the world largest city center square covers an area of 49 hectares. Forbidden City is located next to Tiananmen Square, it is the home to 24 emperors of Ming and Qing Dynasty. Before back to your hotel let’s visit a Chinese Silk Factory for free of charge. Our tour guide & driver will pick you up from the hotel early in the morning, drive to Mutianyu Great Wall. It is famous for its beautiful surroundings and has become part of the glorious culture of China. 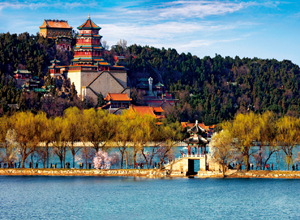 Having lunch, we are going to downtown Beijing to visit Summer Palace which was constructed in 1750 by Qianlong in Qing Dynasty and rebuilt by Emperor Guangxu is the best preserved imperial garden in the world. Visit a Jade Factory on the way to the Great Wall. Our tour guide & driver will pick you up from the hotel in the morning. Move to the venue for the Ming and Qing emperors to offer sacrifices to the Heaven and pray for harvest– Temple of Heaven, the venue for the Ming and Qing emperors to offer sacrifices to the Heaven and pray for harvest. Have lunch and go to Hutong tour with Rickshaw. It is one of the symbols of Beijing, everyone who visit Beijing wants to feel the unique culture of Hutong. We will transfer you back to Tianjin Port safely after our trip. *Visit Chinese handicraft factory for free of charge.